How often is a marketing meeting centred around the current sales forecasts and scrambling for ideas on how to make up the numbers? Or the discussion revolves around how head office didn’t like the colours used in the last round of creative so your agency is working desperately to come up with other options. It’s so easy to be distracted by the internal politics, opinions and priorities of your business but without the customer at the heart of the discussion, you’re sure to be working hard towards exactly the wrong target. Try starting your marketing meetings with a story about a recent conversation with a customer that blew your mind with inspiration, a negative customer review that got you worried, or a piece of research that could turn your current strategy on its head. In an ideal world, every marketing activity is intertwined in a broader strategy that works toward a bigger picture goal. But sometimes little activities sneak in here and there that disrupt (and not in a good way) the story you’re telling. Throw a bit of budget at some display ads. Jump on a hashtag last minute. Take advantage of some PR stunt your agency just pitched you. Or maybe all of your marketing is a little haphazard and one big experiment. Well, experiments are good. Experiments can lead to something great. But if there isn’t a reason that ties everything together, it’s all going to look a little random and a lot of a waste of time to the outside world. Find your reason in your customers and you have a steady star to sail towards. Maybe you’re rehashing the same marketing activity over and over, following the same seasonal themes and sending the same standard product messages. If you’re in this situation it’s likely your entire industry follows a status quo; unwritten rules on what marketing does and does not look like in your market; assumptions about what your prospects and customers do and don’t want. Everyone gets a little lazier and a little too worried about what the main competitors are doing instead of what the customer actually wants. To get out of this cycle, try observing an industry the complete opposite of your own, watching for activity or messaging that refreshes your perspective on your own product. We’ve all been there: we get way too excited about a chance to be creative or try out some new technology that we lose sight of whether the activity will be meaningful to those we’re meant to be serving. Starting with a tactical idea and then following up with the customer research to prove it’s viable is quite frankly, a waste of time and budget. Do the research first, then brainstorm the solution. Sometimes your original hunch will be spot on, other times an even more exciting opportunity will arise from an insight you’d never even thought of. The phrases “we’ve always done it this way”, “she hasn’t been working here long enough to understand” and “we tried that years ago and it didn’t work” are stated proudly and often. This is an easy habit to fall into especially when staff have been with the company for a number of years. Value the experience you have internally and mine it for insights that will help you steer clear of obvious dead ends. Be prepared that you will also uncover opportunities begging to be explored from a fresh perspective. Brainstorming ideas around the table with your colleagues can be fun. It can re-energise the day and help with team cohesion. But if you’re just trying to solve fake problems (similar to fake news; if it’s said often and with enough confidence, it becomes real within the company psyche) your activity will fall flat. Never brainstorm without a clear external insight. Only then will you come up with the real gold. There’s nothing more frustrating than working for the second, third or sixth best company in your industry and getting stuck in that rut. Watching the market leader win a larger audience time and again, selling more, getting better reviews. Yes they may have more budget than you. But a low budget does not in any way stop you from acting on what others have learned the hard way. For a start, don’t be afraid to benchmark your competitor’s activity. All their activity is laid out in front of you. It couldn’t be easier to watch and analyse multi-channel marketing of any large company and understand instantly what works and what doesn’t. In this way you can benefit from the biggest budgets, teams and resources by simply emulating what works. Make sure you’re matching their best features - told with your own brand’s voice and creative spin - and then do better at what they do the worst. Corporate restructures are prolific and it’s common place to have had to weather at least one or two in your career. When a restructure causes the upheaval of new, changed and dissolved roles, or the formation of entirely new teams, customers (not just staff) can suffer. We can lose sight of who we’re working for when wrapping our heads around a new internal culture, processes, leadership and ways of working. Reaching out to your customers can help a team to find a new common ground; something you can all embrace and champion in unison. Perhaps your team is small and everyone is caught up in daily operational tasks just to keep the wheels turning. Even in bigger teams it can be easy to get caught up in running reports for the sales team, preparing presentations to the boss, answering questions from logistics and making changes to an agency proposal. The list is endless. Many parts must work together to run any business, sure. But it’s highly likely that a lot of what you’re doing every day has absolutely no impact on your customer’s experience of your brand or your product. In fact, just the opposite - it’s likely a lot of what you’re doing is getting in the way of delivering an experience that meets the expectation of your customer, let alone pleasantly surprising them or even making the interaction enjoyable. Talking to customers is at the very least, a way to step outside your day to day workload, at the very most a wonderful way to realise where your priorities should really be. By listening to those you’re partnering with (suppliers, manufacturing, logistics, retailers etc) you’ll learn more about the supply chain and how its many parts can better serve the end user. It’s guaranteed your partners have insights that you could collaborate on to find creative solutions. Also, when parts of the supply chain are broken it will inevitably impact your end user negatively. You’re probably not aware of the degree to which that’s directly affecting their relationship with your brand. All roads lead back to you whether you caused the issue or not. So first of all; own it. Then start making time to ask questions and listen. It doesn’t really matter how your business is tracking you should always be in contact with the audience you want to serve. Whether you want to keep the ones already engaged, increase engagement or attract new fans, the best way to their heart and minds is to ask and listen. The next challenge is then to determine which findings are truly powerful insights and which findings are just no brainers that you should address straight away without fanfare. Take the first step in the Design Thinking process and start listening to your customers. Download the ebook to find out how. Thank you! Your ebook “What do your customers want? 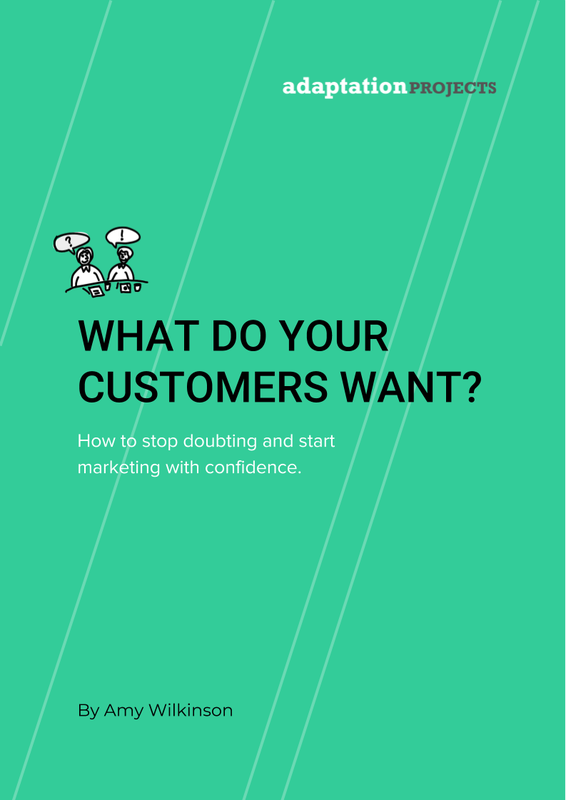 How to stop doubting and start marketing with confidence” is on it’s way to your inbox.